CentreStage showcases fabulous authors from around the world and today it is my great pleasure to welcome fellow German expat, Barbara Winkes. We met on Twitter, got chatting and the rest is history! 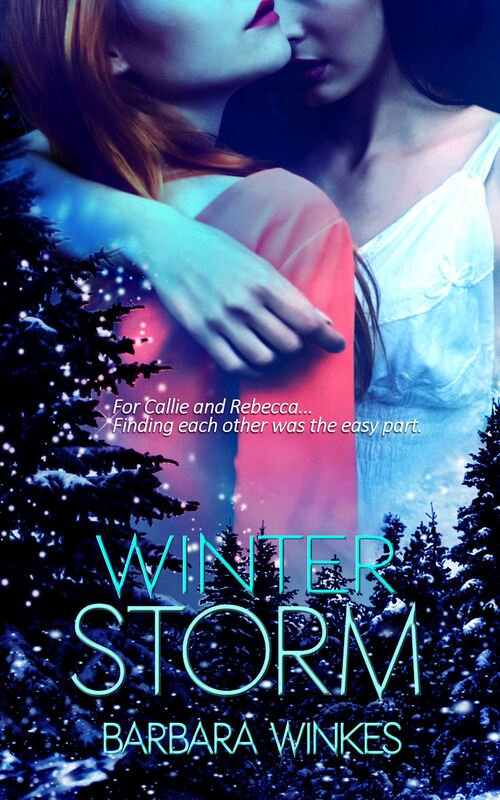 Barbara is here to introduce her second novel, Winter Storm, the sequel to Autumn Leaves. She’s also hosting a Q&A with her heroine, Rebecca, so read on~you’ll be intrigued! For Callie and Rebecca, finding each other was the easy part. In the follow-up to Autumn Leaves, Rebecca and Callie have made a commitment to their relationship. New challenges arise as Rebecca continues to find her identity. Callie is confronted with an ex she would have preferred to avoid. Nicole wants to be back together with her, and she uses all her manipulative skills to achieve that goal. With a new minister in town and an unexpected threat, Rebecca and Callie will face even bigger trials. How much can their new-found love take? Rebecca’s life in the small town of Autumn Leaves changed drastically when she fell in love with her neighbour~a woman! Since that revelation, she’s had to make some tough decisions, and we’ll be talking about them today. Thanks to Nicky for having us on CentreStage! When did you move to Autumn Leaves or did you grow up here? What is the best thing about living in a small town and what is the worst? David and I moved to Autumn Leaves shortly after we got married. That was seventeen years ago. I wasn’t so sure about the town at first, but we quickly made friends and thought it was a great place for children to grow up. We were mostly right about that…Living in a small town is a little like high school. If you can fit in and make friends, you’ll be okay. It’s when you stop playing by the rules that you’ll learn who your friends are. The difference is that in high school, you can’t just walk away. Callie and I probably could, but this is our home now, take it or leave it. It was pretty quiet. I was never one to make waves, so I didn’t get into any serious trouble. I always dreamed of a house full of love and laughter, rather than rules. I wanted my kids to know that I love them without making them have to guess. My parents wanted me to have a good life, but there wasn’t much talk about feelings. Growing up, what were the dreams you had for yourself? Most of all, I wanted to be with someone who loves me, and have a family with that person. Does that sound silly? Not at all! What dreams do you have for your daughters? I want them to be happy with the choices they make in life. I want them to be happy, period. What was your first impression of Callie Bryan? My first impression was, oh my, I’m in trouble! Seriously, I wasn’t actually that insightful. I thought we could be friends. I thought she was beautiful. Does it matter what your friends think of you? Of course it matters. You’re friends in the first place because you share some of the same beliefs, opinions and interests. I was disappointed and scared when Betty reacted the way she did, because she’d been in my life for sixteen years. If the friendship is for real, you try to overcome difference. When did you know your life was about to change? Honestly, I knew long before I was able to admit to myself what was going on. My family, my home was the center of my life for so long. If there was anything else, I didn’t think about it, I didn’t want to see it. I found excuses to spend more and more time with Callie. Sometimes I didn’t have any excuse…I knew I had to do something, and I was scared of the consequences. I wish I had been brave enough to face the truth earlier. I didn’t want to end up all alone…I guess that was selfish and it resulted in people I love getting hurt. I regret that a lot. I hope that after all the changes, life will calm down for a bit, for my girls, Callie and me. We have definitely earned it. Barbara Winkes is a psychologist/trauma counselor by training and a writer by choice who moved from a small town in Germany to Québec City where she lives with her wife. She writes lesbian romance and mystery. Her novels Autumn Leaves and Winter Storm were published by Eternal Press. She is currently working on the next installment in the series. This entry was posted in CentreStage and tagged Autumn Leaves, Barbara Winkes, CentreStage, Winter Storm. Bookmark the permalink. Great interview. I love how you interviewed the characters . I reviewed this book and was really pleasantly surprised at the style and flair of the author. This is a very good book and the characters come to life for you as they did in this interview. Great job Barbara. Good luck for your next book. Hi Linda, thank you so much for visiting and commenting! (And apologies that your second comment disappeared ~ I can actually see it now but I’ll leave your original comment live, if that’s okay). It’s really nice to meet you and I love your enthusiasm for this book, its characters and its authors. I’m thoroughly intrigued and I will have to catch up with Callie and Rebecca’s full story as soon as possible. Thanks again for taking the time to comment ~ I really appreciate it. Rock on! Great cover. Has captured my interest. Wow – great characters and a gripping story – and what a fabulous cover. Nice to meet you Barbara – I’ll look out for you on Twitter. Thanks for the intro, Nicky! Great interview. What an original story! It’s intriguing, isn’t it? Thanks for visiting and commenting, Steph!